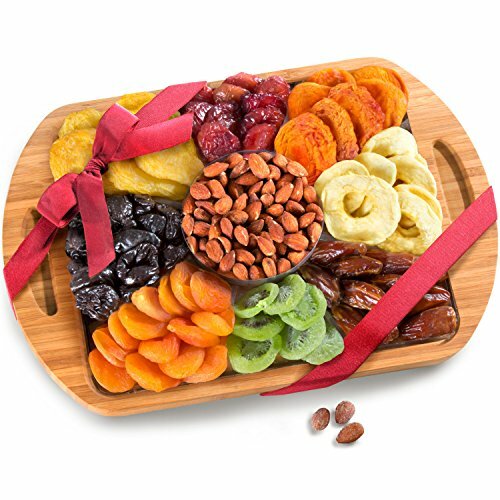 An assortment of healthy dried fruit with a savory centerpiece of roasted, salted almonds top a reusable bamboo serving with handles tray that doubles as a cutting board. Dried fruits include pears, kiwi, dates, peaches, apples, prunes, and Mediterranean apricots. Beautifully presented in an attractive arrangement with a healthy serving of roasted salted California almonds. Ready to give or serve in a beautifully styled bamboo serving tray cutting board with handles to be used long after the food is gone.